In order to do away with too many switchbacks, the site for the Silas Mason company railroad bridge has been changed from the original location above the Tuttle Brothers’ ferry to a point a quarter mile downstream, near the U.S. Geological gauging station. It was found that after the first location had been fairly definitely decided upon that because of the high elevation of the government railroad it would take three or four switchbacks to reach the river’s edge there the line would cross on the bridge. On the other had if the company built the bridge higher to do away with these switchbacks it would necessitate building them on the opposite shore to bring the line down again. The new plans call for the construction of the line from the Osborne canyon, where the U.S. Construction railway begins its switchback to the powerhouse, to follow the sheer granite mountain side, on the northwest of the model engineers’ town to the river shore. This arrangement will not interfere with any engineering plans for the town. It was necessary to take the tracts below the gauging station because of the depth of the river between the ferry slips and the station. A deep gap seems to feature the river floor between these two points. Below the river-measuring plant the river is comparatively shallow. The second decade of the 20th century can be characterized as the “Golden Age” of railroad history. Nationally, track mileage peaked in 1916 at 254,000 miles, and both goods and passengers regularly traveled by train. Here in Grant County, laid track also peaked, and numerous small towns had sprung up in the high desert because of the easy access afforded by rail. The 1920s began the decline of the railroad, both locally and nationally, for many reasons. Changes in modes of transportation, government intervention and World War I, and local weather and economic issues all played a part in railroad history in Grant County. In June of 1914, the first world war began, eventually drawing the country into the conflict half a world away. As war resources began to be shipped from production locations to the battlefront, the government pushed for greater speed and efficiency in transport. Manufacturers had previously sent their goods along their favorite railroad lines, no matter how inefficient. Under the Interstate Commerce Commission (ICC), the route of travel, efficient or not, shared the same rate for the total service; in order for a railroad to gain any profit, a manufacturer must send their goods along that line and thus grant it a piece of the shipping pie. For the moment, individual railroads were making money, but goods weren’t traveling fast enough, and a shortage of cars was beginning to hamper both normal business traffic and government war efforts. A few months later, in August of 1914, the new Panama Canal opened for business hundreds of miles away from the Basin. It wasn’t long, though, until its effects were felt here, limiting the business transported across the county in favor of a water route to the east coast. Ironically enough, the original engineer for the canal was John F. Stevens, the former chief surveyor for the St. Paul, Minneapolis & Manitoba (SPMM) who located Stevens Pass in 1890, and would eventually act as a consultant on the project to construct a second Cascade tunnel, which has benefited the State of Washington for the last sixty years. In reaction to the chaos ensuing in the industry, the railroads had come under government control at the very end of 1917 to improve traffic flow throughout the United States during war time. Shipments were now required to be sent along the most efficient path, so the payment of rates went to the line with the most direct route from point A to point B. Smaller and more remote lines naturally earned less profit, relying more on local agriculture and business. During this time period, though, loads of freight declined too, as the drought of 1917 to 1924 hit Columbia Basin farmers hard. Many moved away after crops failed to produce the amount grown in previous years. Fewer people buying what was left meant fewer shipments to towns. Fewer and smaller crops meant less grain to move to market by rail. The picture was bleak, despite the prosperous war economy elsewhere. On November 11, 1918, the war ended. The railroads, though, were far from safe and continued to struggle under ICC oversight, government ownership, and economic hardship. The Chicago Milwaukee & St. Paul (CMSP) completed the electrification of its mainline between Othello and Tacoma in 1919, the only line in Grant County to do so. This gave it the ability to use electrically-powered locomotives to move its trains, rather than the inefficient steam locomotives of the past. The cost of this venture was substantial, and paired with the loss of an impressive amount of business to the Panama Canal, bankruptcy was a dire possibility. The war had sustained the CMSP, which now discovered that they only carried 1/10 of the potential of their new line. Demand for rail service had crashed, leaving several railroad lines in financial straits. On March 1, 1920, by order of President Wilson, the government control finally ended American railroad's 26 months of nationalization. The control had allowed the government to run all the railroads as one big system, instead of the many individual companies. While this allowed for direct routings of freight, it also meant that unneeded passenger services were dropped in favor of the automobile. Still, larger railroad companies continued to plan for expansion. The Northern Pacific (NP) did many cost studies on the use of the CMSP between Lind and Ellensburg in the early 1920s. During 1922, the NP was still considering this option, which would shorten its mileage across the state, in the hope of speeding transcontinental freight runs. One of the many things the NP considered included whether they would be fully responsible for any costs associated with fueling and maintaining steam locomotives, since the CMSP was electrified through most of this section. They were also very concerned for the grades involved in getting up the west bank of the Columbia River. A second option used the CMPS to the Beverly area too, before turning south and crossing the Columbia in the vicinity of Priest Rapids by way of a newly-built line in their own name. Heavy grading between this crossing point and the Yakima area kept this option from being considered further either. Another part of the industry’s decline was due to regulations placed on the railroads by the government, via the ICC. While general and maintenance costs rose dramatically during the war, railroads were not given permission to increase their rates to match inflation and thus recoup these losses. As the public began abandoning old-fashioned rail travel and took to the automobile, and as road quality continued to increase over time to the benefit of truck service, railroads found it harder to maintain branchline and mail service to every remote place. Mail continued to be delivered by rail, but to fewer places than once served. One cutback was the discontinuance of Central Washington’s train between Adrian and Coulee City on June 28, 1925. A few months earlier, in March, the CMSP finally succumbed to bankruptcy, and finally reorganized as the Chicago Milwaukee St. Paul & Pacific on January 13, 1927. This was just one of the many changes made on Grant County railroads in the 1920s. Krupp, a small community on the Great Northern line had originally been named by railroad officials trying to flatter a local German immigrant farmer. A prominent and centuries-old German dynasty by that name manufactured armaments for American foes in World War I, prompting a demand for a renaming of the town amid anti-German sentiment after the war. A suggestion had been Crab Creek, but this was a duplicate of a town in Lincoln County. The name of Marlin was finally adopted in September of 1918, as a reference to another early settler, John Marlin. The depot in Marlin burned down on May 18, 1925. A year later, a 24’x48’ depot was moved from Downs (east of Odessa in Lincoln County) to the same location, and it survived there for ten years. Coulee Junction’s name was likewise deemed to be too similar to another railroad town, this time to Coulee City. The new namesake was a W.H. Adair, who owned a ranch near the junction and operated a restaurant in Coulee City. This name, too, needed to be changed because it was too similar to Adrian, the junction fifteen miles to the south. On June 1, 1922, it was renamed Odair by the NP. The Great Northern station at Wilson Creek was established as an intermediate terminal in 1892 and was situated with a roundhouse and a large coaling dock. The terminal itself was moved to Wenatchee in 1925, at the same time that the Leavenworth terminal was closed. These two changes coincided with a related project on the Great Northern line over Stevens Pass, which abandoned a 2.6-mile tunnel and bored a new 7.8-mile tunnel. Coulee City, though, remained a viable intermediate terminal through this decade, but in a different form than is seen today. In 1926, the following railroad items were to be found there: a two-story passenger and freight depot; a stock yard; a large ice house; a two-stall roundhouse; a 56-foot, bridge-style turntable; a sand and oil house; an ash pit; and a coal dock and shed with 254-foot loading trestle and 206-foot approach trestle. This was typical for an end-of-branchline station, or intermediate terminal. Only the depot remains, though not in its former location, and the occasional remnant of a foundation. The last significant railroad event in Grant County in the 1920s occurred on February 1, 1927, when the Northern Pacific and the Great Northern filed application with Interstate Commerce Commission for their third attempt at uniting the two companies. This was similar to the second planned merger back in 1903 that caused the building of the branch from Coulee City on the NP to the mainline station on the GN at Adrian. The unification did not happen at this time, due to restrictions placed on the two railroads that they did not want to keep. The ICC, under a mandate to set up regional railroads to replace the multiple private rail companies within each region, had demanded that the two companies sell a mutual subsidiary line which ran to Chicago from St. Paul. Both companies declined. As the second decade of Grant County’s existence drew to a close, the rail industry faced difficult and desperate times. The next decade, though, brought another federal stimulus to the region, sustaining the railroads for another decade. A 150 to 200 feet long tunnel will be bored through the solid granite mass northwest of the model engineer’s townsite, Harvey Slocum, construction superintendent for the MWAK, declared Saturday. Jack hammer men were at work Saturday on the first stretch of the Mason railway which will connect up with the U. S. Construction railway from Odair to the dam site, now being built by David H. Ryan and Crick & Kuney. The tunnel will be located approximately 100 feet from the spot where the company line connects with the government’s. The tunnel is necessary, Slocum explained, in order to do away with making an almost impossible turn along the outside of the 800-foot solid rock wall. By boring through the granite, no sharp curve will be necessary. Locomotives and cars will run through the tunnel, then along the outside of the mountain of rock to a point near the U. S. gauging station, over the railway bridge, yet to be built, then along the 1020 level on the on the east shore to a point near the Addison-Miller camps. The railway bridge will be a timber-truss affair. Photo of the completed tunnel can be seen here. Here is the unedited version of the Centennial piece that appeared in print on 5-22-09. As if the Roaring ‘20s hadn’t brought enough change and the Depression era of the ‘30s weren’t too solemnizing, the decade of the ‘40s brought more of both across the country, as well as in Grant County. The largest project the region had ever seen – the construction of Grand Coulee Dam – was progressing nicely in 1939. With the help of the government railroad line from Coulee City to Grand Coulee, a long-standing record was set for the largest amount of concrete placed in 24 hours, at an impressive 41,000 tons on May 25. Materials and supplies for the construction effort continued to pour into Grand Coulee for the rest of the decade. As the county looked ahead to the Columbia Basin Irrigation Project, plans began to be laid for creating irrigation districts to manage the water soon to be headed south from the great dam. The legislature first created the legal foundation for irrigation districts; then landowners locally and across the state were convened to vote on the creation of these districts. The Great Northern line was instrumental in this action, conducting a special train to bring absentee landowners from the west side of the state to Grant County to vote on this historic measure. The special train itself was an unusual sight. Passengership on the railroad lines had been suffering from a severe decline throughout the Great Depression, which was only slightly preceded by the increased popularity of private automobiles over rail travel in the 1920s. Many measures were being employed to try to lure customers back to the railroad; one of these was to modernize the fleets. Over the previous decade, passenger cars that had once been made of wood and iron were now being constructed of stainless steel, with additions of aluminum and Cor-Ten steel. This reduced the weight of the cars, giving streamlined speed and greater comfort to the passengers – as well as a more streamlined look – compared to the “rattletraps” described in the early history of trains. Many of these steel cars went unpainted except for the legally-required reporting marks. Inside, car builders created luxurious rooms and private compartments, such as the Pullman Company’s roomettes – one-passenger suites similar to the twin-berth compartments used in Europe. Even these amenities, though, didn’t make up for low ridership. People were taking to the new highways at an unprecedented rate, and rail companies were beginning to sell off unprofitable ventures, such as the interurban rail system between Everett and Seattle, which had been in place for forty years. The world was changing. Cars were becoming increasingly popular, prompting the construction of new highways; public transit in any form was in a long, slow decline, including the urban streetcar systems. Even the majestic steam engines of the past were on their way out, making reluctant room for new diesel-powered locomotives. Steam engines were becoming unwieldy monstrosities. The size of the engine components had nearly outsized the capacity of the tracks to hold them, and required more mechanical operation than ever before. Maintenance requirements slowed turn-around time after each run, and the constant necessity for water stole precious time. With the advent of mass-production of the diesel locomotive, steam engines were being relegated to yard work, scrap yards, museums and amusement parks. General Motors’ Electro-Motive Division was the first to mass-produce the new locomotives. Its “FT” toured the country at the beginning of 1940, showing off 5400 horsepower in four power units, and blowing past steam locomotives at every turn. Instead of the frequent water and maintenance stops, it seemingly turned on a dime and did twice the work or more. It could be idled for days at a time, run by one man instead of a team, and created less noise and smoke pollution. Multiple units could be coupled together – or scaled – to complete larger jobs as well. It was reliable, comfortable for both passenger and crew, and with thermal efficiencies running at 73% compared to steam’s 26% or less, it appeared to be an engineering miracle. Steam engine producers couldn’t keep up; as the companies began switching to the longer-hauling diesel trains, smaller division points began to close. Besides the impressive sight of these new machines rumbling past (Milwaukee Road’s first diesel on the mainline ran from Avery, Idaho to Othello, Washington on November 6, 1941), much of the Basin was unaffected by these changes. Passenger service was still operational between the small towns of Grant County and surrounding areas, but sleeper compartments and luxury accommodations weren’t the most important features considered when travelling anywhere locally. One change that made an appearance in 1940 was the name switch for the railroad post office on the Northern Pacific from “Coulee” back to “Coulee City” on February 25. Again, though, it was a minor change and few took notice. What did bring notice, though, was the news in June that Nazi Germany had conquered France. Four months later, the military initiated the first peacetime draft in United States’ history. GN’s president, Ralph Budd, was appointed to be the Transportation Commissioner on the Council of National Defense, and began to determine the plan for the transport of troops and supplies during the inevitable involvement of the U.S. in the war. During WWI, this level of planning hadn’t been accomplished and railroad officials wanted to be prepared for changes affecting their business practices. Budd’s policy centered on the “discontinuance of trains that are not necessary.” He warned the railroads six months ahead of time to expect troop movements to double in 1942, but advised they not expand their fleets; in fact, he asked them to consider which trains could be dropped. A month later, the military issued the same directive, and when the country entered the war on December 4, 1941, these predictions came true. Troops moved from the interior of the country to the coasts, and supplies for military production moved back to the interior from coastal ports. The entire state of Washington was actively engaged in converting raw materials into finished products and shipping them back to military posts on the west side of the state. Passenger service was all but suspended. Civilian riders holding tickets were regularly bumped from their scheduled train due to lack of seating. Abandonment of branch line tracks was considered, to help with the wartime shortage of metals, but other than a few spur tracks to nowhere, no rails were lifted in the Columbia Basin. Most branch line traffic in Grant County was agricultural in nature, not participating in wartime industrial expansion, and so remained fairly stable. The notable exception was, of course, the U.S. government railroad to Grand Coulee. A year after the draft was initiated in 1940, the first generator came online at the new dam, providing the first delivery of locally-generated electricity to Nespelem’s Rural Electric Association on September 12. Other generators were yet to be completed, and the construction of the irrigation pumping plant was just beginning, so the rail line continued to be used heavily. When the war came home with Japan’s attack on Pearl Harbor on December 7, 1941, the realities of the situation did finally touch the Columbia Basin. Local Japanese immigrants and naturalized citizens were forced off their farms and out of their communities as far east as Yakima by Lieutenant General De Witt’s Public Proclamation Number One, delivered on May 26, 1942. These evacuees were shuttled to Portland by train, and then on to the Heart Mountain Relocation Center, northwest of Cody, Wyoming. The construction of the irrigation system stemming from Grand Coulee Dam was put on hold as well, in order to supply much-needed energy to aluminum plants and to the top-secret Manhattan Project at Hanford, which began in March of 1943 after the condemnation of private land for an undisclosed military purpose. Generation of electricity took precedence; officials at Grand Coulee even borrowed generators from other facilities for a short time until the dam was sufficiently completed to do the job. While Hanford was specifically chosen by the Army and its contractor DuPont because of its remote location from highways and railroads, 158 miles of new track were built on the site and linked to the Milwaukee mainline at Beverly. The Milwaukee was also used to move much of the town’s population in one quick operation to other locations outside the project site. Not even the 51,000 employees at Hanford knew what was being created there. Secrecy and defense of those secrets was a focus of a great deal of energy, since no one had any idea when one or all major projects could become a target for Japanese and German attacks. Grand Coulee Dam, too, could be a target, as could the government railroad supplying workers there with materials to create greater hydro-electric generating capability. A young married couple living in a remodeled railroad car in Odair, at the head of the government line, took the job of Air Raid Warden in 1942 under the national Air Raid Program. Roy and Maxine Ramey watched the sky for suspicious airplanes and policed the use of blackout shades in their tiny neighborhood of four people. In an interview with the couple, they shared that Roy’s hours, and thus Maxine’s as well, numbered 62 a week – nine each on Monday through Saturday, with an extra eight on Sundays. Maxine reported that they typically saw one or two planes a day during the six years Roy served his country and community under this program. At the other end of the county, ten military passengers – not yet to the front where they would serve – were killed, ten others injured, and one railway official also injured in a train wreck near Warden on August 4, 1943 at nearly 1 a.m. In this case, the length of one car caused severe destruction and loss of life when a regular train didn’t pull far enough into the clear to allow a special military train to pass safely. When the locomotive of passenger train Extra 251 West collided into the locomotive of mixed train Extra 849 West, which was frantically trying to move backwards off the mainline at 2 miles per hour, the former train was moving at 55 miles per hour. Train 251 was pulling twelve Pullman sleeper cars of military personnel; car eleven telescoped more than thirty feet into car twelve. With the increased traffic came increased chance of accidents; until this point, the county had been spared any major rail casualties since 1917. In Ephrata, more changes were afoot. A rail transportation department had been created to fill government orders for the transportation of freight and troops whether by train, or by other means. On August 27, 1942, this name was changed to the Transportation Corps, and more personnel were granted to it to accomplish its duties. Two personnel were assigned to the Ephrata GN Railway station, where Mr. E. C. Pittinger, railway agent, allotted them 100 square feet in which to set up their operations. In the next two weeks, the GN and military engineers began construction of a railway spur track from the GN mainline to a warehouse area on the new Ephrata Air Base. This short spur minimized freight handling, added efficiency, and provided secrecy for military movements on and off the air base. The air base eventually purchased their own Plymouth gas-powered locomotive, but before this, the GN used its own local power to switch cars on the military spur. Small gas-powered “tug” vehicles, used to move planes between the hangars and the airfield, were also used to move rail cars from the spur to various unloading points. Walt Thayer, a Civil Service guard for the spur, recalled in an interview in 1993, that he often had to repair switchpoints and rerail cars after these tugs mishandled the boxcars. He also recalled that penny-pinching railroad employees would stop their trains on the air base spur while they grabbed lunch at the mess hall for a measly “two bits.” On their way back to the train, they’d convince some other civilian with privileges to find them cigarettes, a rationed item highly desired by many trainmen. To the northeast, at Hartline, the NP tore down the 50-year-old depot on February 3, 1944. This was also the same year the NP built its last new steam engine. In other places outside the county, the war continued, oblivious to the changes the locals were experiencing. In September, the first reactor at Hanford went critical, launching the production of uranium and plutonium that would eventually be used to end the war. Two months later, Japan launched 9000 incendiary balloons from Hokkaido into the jet stream, hoping to set fires on the west coast of the United States and draw resources away from the war effort. On February 12 of the next year, the first of the 28 balloons ultimately to be found in Washington State was discovered north of Spokane. 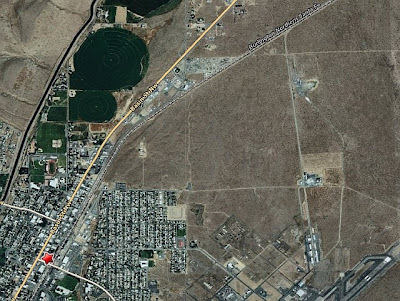 Another balloon exploded on power lines at Hanford, causing a blackout and a halt in operations for a short time. Five days before President Truman announced Victory-in-Europe Day in May of 1945, the Soap Lake depot in the Grant Orchards area burned down under non-military circumstances, to be replaced by a 10’x16’ watchman’s house from a siding by the name of Columbia River, near the Rock Island Dam. It took crews five months to move the small building. Winchester, too, replaced its 37-year-old depot that year with a small shack, which only lasted another six years. With the European end of the war finally over, the Milwaukee Road published yet another letter between their fictional father and son, which included the assertion that the company was planning for peacetime improvements to the line, including new track. The company continued to speak highly of their own ability to handle the increased traffic and requirements during the war, as well as the successes of the Army’s 744th Railway Operating Battalion, whose 6916 members – some employees of Milwaukee – had served on the European railroads during the first half of the war. Little did they know their fictitional prediction that “the Japs won’t last long” would be so accurate. On July 16, the first atomic explosion was tested at Alamogordo, New Mexico. Less than one month later, when the first atomic bomb was dropped on Hiroshima, the northwest would hear for the first time what was happening south of Grant County in that secret complex. The world – and especially the Columbia Basin – was still reeling from this revelation when the second bomb was dropped on Nagasaki; this particular bomb specifically used the plutonium created alongside the Columbia River. When Japan surrendered the next day, all the trouble and sacrifices paid by the railroads, industry, business, government, and even individual citizens seemed to have paid off. The war was finally over, and everyone had contributed to that end. Life slowly began to return to normal. The Milwaukee Road, constantly fighting bankruptcy, announced that it was once again out of receivership in December of 1945. Construction resumed on the pumping plant at the Grand Coulee Dam the next year. In 1947, the Washington State legislature finished its legal battle to construct limited-access highways to ensure fewer accidents on the greatly-popular car routes. The railroads felt this. Officials noted the increase in rail traffic due to the war, following a long, slow slump in passengership. The hope was that, after the war, numbers would average out and level off. This didn’t happen, and still more passenger-service programs were scrapped, including Tacoma’s Municipal Belt Line Railway. It was a continuation of earlier trends, and it didn’t bring encouragement to rail companies or their employees. Despite this reality, the railroads continued their vision of modernizing their lines, expecting that doing so would ultimately bring riders back to the rails. The older wood and iron passenger and box cars had been completely worn out during the war, making the purchase of new cars vital. The choice of luxury cars, though, was rarely allowed by tight budgets. In 1947, the GN was the first northwest road to receive streamlined cars, which they had ordered during the war. The riding public saw these cars as the wave of the future, and for a limited time, ridership improved. New diesels were also featured on the Milwaukee line at the same time. The streamlined “dreamliner” Olympian Hiawatha pulled its first train in June from Chicago to Seattle/Tacoma with a SkyTop lounge on the end, a rounded glass-top observation car. The train also included coach cars, Touralux sleeper cars, and a Tip Top Grill and dining car, but lacked the Pullman private-room sleepers for which the Milwaukee Road had hoped. The trip took 45 hours, the fastest schedule yet recorded between these two endpoints. The Milwaukee also began using end-to-end and dispatcher-to-train radios in Washington that same year. The NP placed its new cars into service in 1947 too. In an ad run locally on June 10, 1947, by Mr. H. L. Hutchinson, railway agent at Coulee City, the NP boasted of their new 4-unit, 6000-horsepower diesel locomotives, 1500 new boxcars, and a fancy, new yard machine called a forklift that could raise “a million peas high enough to walk under.” It seems this common machine today caused great excitement in 1947. Mr. Hutchinson had had plenty of his own excitement that January when the Coulee City depot nearly burned down. The fireplace had burst into flames, and threw embers onto the roof shingles. Hutchinson praised the local fire department for saving everything in his family’s apartment on the second floor, and said that only a package of shingles was needed to fix the damage. Coulee City seemed to be in the news often in 1947, especially in the month of January. The Coulee City News reported on the 24th that wheat couldn’t be shipped out of town due to a shortage of boxcars after the war. Only 29 cars of wheat had been loaded and shipped over the winter, but another 350,000 bushels remained in the Centennial Mills elevator and on local farms. That summer, the old NP roundhouse at Coulee City burned in a “spectacular fire” which completely destroyed the structure. Telephones and power went out during the fire, leaving the fire department’s notification of the blaze to a passerby who opted to drive to the stationhouse. Efforts were also hampered by the distance to a fire hydrant and lack of sufficient hose to reach it. The building was owned at the time by Bitco, a tool-sharpening business involved with the Bureau of Reclamation’s Columbia Basin Project at the nearby Bacon Siphon Tunnel. The railroads finished out this busy decade with high hopes, but deepening worries about their future. Agriculture still reigned in Grant County, though, and the railroad was the most efficient way to deliver those goods to the rest of the country. No one at the time doubted railroads would continue indefinitely in the Basin. Part of an interview with Walt Thayer, who was residing in Wenatchee at the time of the interview. From "Certain Lands Southeast of Ephrata"
"From March to September 1945 I was a civilian (Civil Service) guard for the branch line of railroad that served Ephrata Air Base. I lived in bachelor civilian quarters up near the water tower and WAC quarters. Harry Lee of Ephrata was a civilian mechanic for post engineer. "…During operation of the Ephrata Air Base, civilian employees could eat at the mess hall with the airman for 25 cents per meal. A lot of scrambled eggs were served and they sometimes had a greenish color (I presume they used powdered eggs). Some fellows would not eat their “green eggs” but a civilian employee, Louie Maguire ate them like candy. He was always hungry. "The engineer on the air base locomotive was rather tight-fisted and so were two other railway men assigned to the local freight train between Wenatchee and Wilson Creek. When they found out they could eat at the air base for “two bits” they’d put their locomotives “on spot” in the air base railroad yard and walk the short distance to the mess hall, to beat a cold lunch or paying high prices at the beanery in Ephrata. Sometimes, before returning to their engine they’d arrange for another civilian or airman who had a canteen cart to get them a carton of cigarettes. Cigarettes were rationed and other trainmen envied them." Three recent attempts to derail trains on the United States construction railroad between Electric City and Osborne were revealed today by officials of the M-W-A-K company. The latest effort was discovered Saturday morning. Railroad supervisors in each instance found large spikes driven between the joints of the rails. From six to ten of these spikes were found on each occasion. Vigilance is being maintained along the 30 mile line since the major portion of concrete and supplies is transported to the dam site over this line. Officials said anyone found guilty of such a crime would be sent to the penitentiary. Originally known as the rail transportation department under the quartermaster, its mission was to fill Government transportation orders for both freight and troops, using whatever means possible—rail, bus, airplane, truck, etc. For three months this department was manned by only one corporal and one private. On August 27, 1942 a circular was issued creating a Transportation Corps but the change-over did not take place on this base until December 15. Following a conference with Mr. E.C. Pittinger, station agent for the Great Northern Railway Company, an agreement was reached verbally whereby Mr. Pittinger set aside about 100 square feet of floor space in the Ephrata railway station for the use of two of the departmental personnel who were detailed to handle military passenger and freight matters, using the railroad station as their base of operation. On September 1, 1943, the post engineers and the Great Northern Railway Company started the construction of a spur track from the main line of the Great Northern to the warehouse area on the Ephrata Air Base. It is expected that this job will be completed in October. The installation of this spur will greatly speed up the delivery of incoming freight to different organization; freight handling will be considerably cut down; troop movements will be greatly facilitated and will be made with much more secrecy. On November 12, 1943, Mr. Goudie, the Great Northern trainmaster made and inspection tour of the base spur track for the purpose of checking it for the switching to be done by the Great Northern Company as was agreed in October. The Great Northern engine made its first trip to the base on November 15, 1943, bringing in one carload of coal for the post engineers, one carload of targets for the base ordinance, one carload of engines for the sub-depot and one carload of Teletype equipment for the base signal. The spur takes off from underneath the word "Northern." This is another part of the same photo in the previous post. 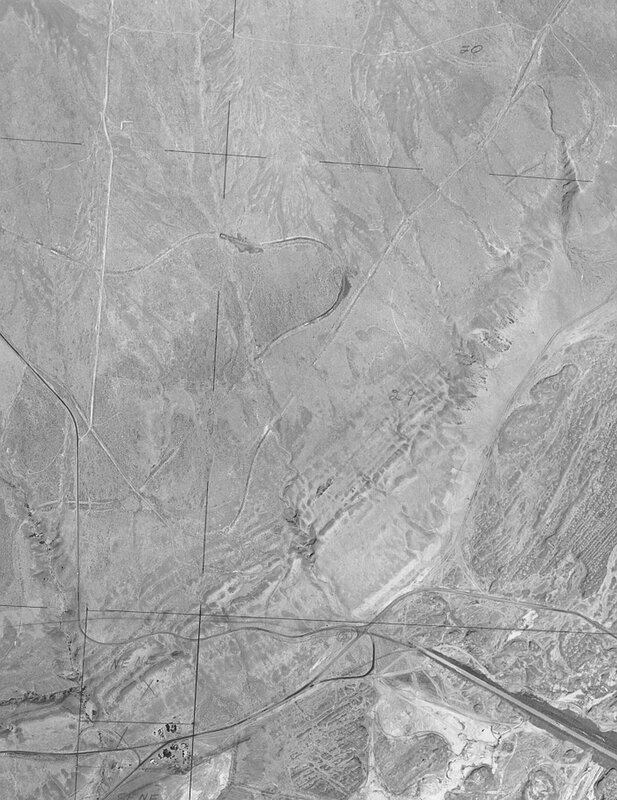 This shows the west end of the South Dam, and shows the highway interchange for what is now US 2 and SR 17, but in their previous location. You can make out the Central Washington grades going up the side of the hill. You can make out the competing Seattle Lake Shore & Eastern grade, which is the one not near as complete as the CW. Note in this view the newly built South Dam at the south end of what would be the Bureau of Reclamation Equalizing Reservoir, now called Banks Lake. You can see the current end of track at Coulee City, and follow 2 lines out into the area below the dam.